The events chronicled in Black Hawk Down have a much higher level of awareness in light of current events in Afghanistan. In 1993, the United States sent troops to Mogadishu, Somalia to bring food to the starving populace and to help bring down Mohamed Farrah Aidid, the ruling warlord. Even with American casualties, the public took little notice of the happenings in Somalia. Black Hawk Down is Ridley Scott's (Gladiator, Hannibal) adaptation Mark Bowden's popular book, which recounts the downing of an American Black Hawk helicopter and the attempts to rescue the crew. It was a mission gone horribly wrong, leading to the complete withdrawal of US troops from Somalia. It's a highly violent yet gripping story, bringing together the tremendous action-oriented philosophies of Scott and producer Jerry Bruckheimer (Pearl Harbor, Remember the Titans). What it lacks in character development and context is more than made up for in sheer visceral imagery. This is less a movie about the political unrest in Somalia than the valiant attempts at survival by various members of the Delta Force, the Army Rangers, and the Nightstalkers. Black Hawk Down throws audiences into the middle of things, after a terse lesson on the political background. By focusing more on the soldiers and less on the politics, screenwriters Ken Nolan and Steven Zaillian (Hannibal, A Civil Action) personalize the events. People can watch individuals on the frontlines, dealing with trying to stay alive, as they enter Mogadishu and fall to ambushes. Somalis shoot down two Black Hawk helicopters, and the US Armed Forces must mount desperate rescue attempts despite the presence of armed, militant citizens. Bowden's book took the time to introduce many of the participants, going into detail about their lives and allowing readers to feel a connection. Nolan and Zaillian don't do this, one reason presumably because of time constraints. This presents a problem, since the cast is enormous. When actors start dying, they are all anonymous to the audience; little more than extras. So while the use simultaneous stories adds a sense of breadth and heightens the tension, the audience has less of an emotional attachment to the participants. There are only a few actors that stand out. Josh Hartnett (Pearl Harbor, Town & Country) is Ranger Staff Sgt. Matt Eversmann, who is leading his men towards one of the downed helicopters. Hartnett has the largest role and the highest profile, but does not bring much to Eversmann. The real discovery is Australian Eric Bana (Chopper, The Castle), who plays Delta Sgt. First Class Norm Hooten. Bana, who will soon play the Incredible Hulk, exploded onto American screens with his violent and comic depiction of murderer Mark "Chopper" Read in the little seen Chopper. As Hooten, Bana is the voice of reason amongst increasingly agitated soldiers. He (seems) to have the most experience, and is the most levelheaded of all the characters portrayed. Hooten acts like an emotional anchor for the rest of the character, providing guidance and advice, especially to Eversmann. Hooten is the only character who is on screen long enough to develop a personality. Other actors like Tom Sizemore (Pearl Harbor, Red Planet), Sam Shepard (Swordfish, The Pledge), Ewan McGregor (Moulin Rouge, Nora), and William Fichtner (What's the Worst That Could Happen?, Pearl Harbor) are all notable in that one can recognize them on screen for the short time they are there. Shepard does little except sit behind a radio and look annoyed. Nothing about their performances is notable. It's definitely a trade-off; do Nolan and Zaillian focus on a select few and get a more cohesive plot, or do they spread their resources to get a bigger overall picture? What stays after viewing the movie is the violence. 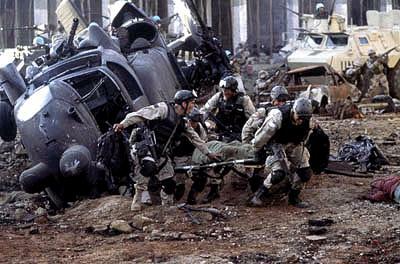 Like Saving Private Ryan, Black Hawk Down has an unbelievable amount of blood and violence. Scott's purpose is to show the horror that these men endured. In doing so, he wants to demonstrate their courage and valor, and coming through such horrible circumstances. If Scott can do one thing, it's make an action movie, and there is plenty of action here for him to play with. 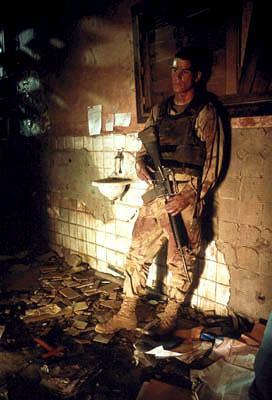 Debris falls everywhere around the confused soldiers, and blood spurts from detached limbs. In a way, Scott is tricking the audience. It is riveting watching his movie, but it is more of a morbid fascination of watching what he is willing to show on screen rather than watching any character development. To be fair, the drama does intensify as the movie progresses and as attempts to reach the downed helicopters become more frantic, and Scott is able to whip up the tension to an incredible level by switching between stories. He alternates among his small groups of soldiers trying to regroup, balancing fierce battle scenes with scenes of false serenity, just waiting to be shattered by gunfire. Watching Black Hawk Down is an experience, just not the one Scott probably hoped for. 2 hours, 24 minutes, Rated R for intense, realistic, graphic war violence, and for language.